MTR100 '13 Greensea Systems, Inc.
Greensea Systems, Inc. founded in 2006 to provide the offshore industry with advanced control and navigation software in an operator-friendly format. Since our start, we have grown steadily and have invested heavily in the development of a navigation and control technology that enables unprecedented increases in operator efficiency and capability. • openSEA. Greensea anchors its navigation and control technology with the Open Software and Equipment Architecture, openSEA. Greensea designed and developed openSEA specifically as a modular programming environment for unmanned vehicles. openSEA is built on a robust error reporting and communication backbone and provides proven and tested software modules ranging from optimal control and Kalman filtering, to data management, to native support for hundreds of widely used sensors and devices. • openSEA Suite. 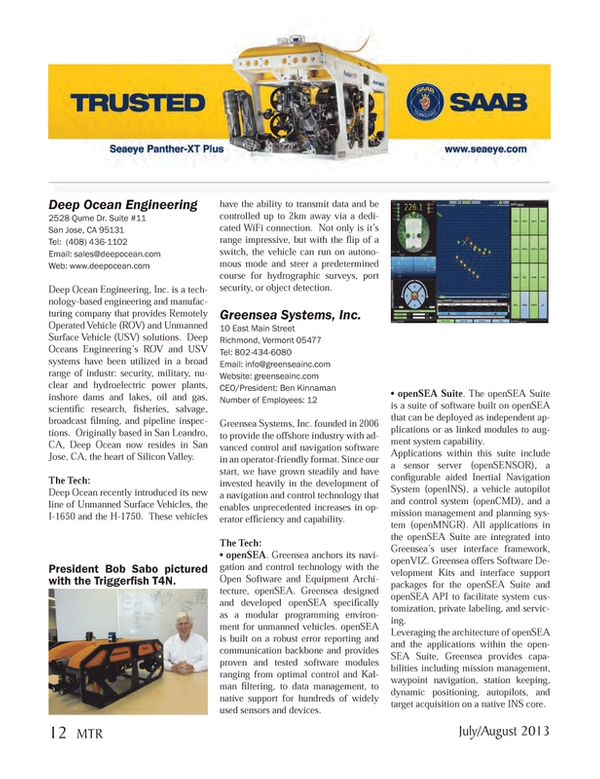 The openSEA Suite is a suite of software built on openSEA that can be deployed as independent applications or as linked modules to augment system capability. Applications within this suite include a sensor server (openSENSOR), a configurable aided Inertial Navigation System (openINS), a vehicle autopilot and control system (openCMD), and a mission management and planning system (openMNGR). All applications in the openSEA Suite are integrated into Greensea’s user interface framework, openVIZ. Greensea offers Software Development Kits and interface support packages for the openSEA Suite and openSEA API to facilitate system customization, private labeling, and servicing. Leveraging the architecture of openSEA and the applications within the openSEA Suite, Greensea provides capabilities including mission management, waypoint navigation, station keeping, dynamic positioning, autopilots, and target acquisition on a native INS core.